Doing a whole chicken, however, is a whole different animal. The bird has such an odd shape that doesn’t cook evenly. 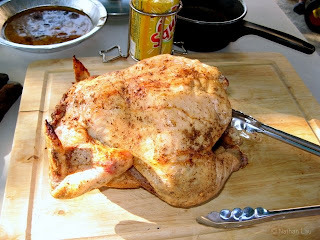 Grill the bird long enough to fully cook the dark meat, and you risk having dried out white meat. You have to find a way to cook the chicken until it’s done, while keeping both the white and dark meat moist. “Beer can chicken” is one way to do this. 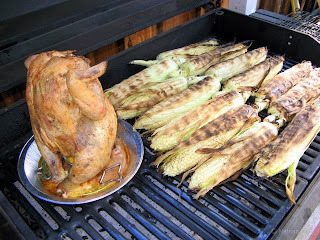 It is a form of vertical roasting (holding the bird upright instead of laying down on its back) that also involves placing a can of liquid (usually beer plus spices) up into the body cavity. The theory is that the liquid in the can evaporates and steams the meat from the inside, keeping it moist. I made a beer-can chicken using the “Spicy Beer-Can Chicken on the Grill” from Fine Cooking Magazine, August/September 2005 issue, pp 46-47. The chicken was rubbed under the skin with a rub mixture containing salt, ground toasted cumin, chili flakes, ground coriander, ground mustard, ground black peppercorns, onion powder and garlic powder. HINT: Rubbing under the skin ensures that the meat will get all the flavors from the rub. Outside the skin, the rub would just melt off with the fat. The beer-can sauce started with half a can of Heineken, ketchup, Dijon mustard, molasses, white wine vinegar, some of the spice rub, and some hot sauce. Grilled the chicken over indirect heat with the cover temperature around 350*F. This pic was taken about halfway through, when I started grilling some corn over the flame. I removed the chicken when the internal temp on the thigh hit 165*F. I tented it with foil and let it rest for 15 minutes (to allow for carryover) before carving. I poured the sauce from the beer can plus the drippings from the pie pan into a saucepan and boiled it down to use as a dipping sauce. The dipping sauce was excellent! Lots of people may say beer can chicken is a gimmick but I can assure you, you will get very juicy chicken if you do it this way. SWIFT Theme by Satish Gandham. 61 queries in 0.681 seconds.